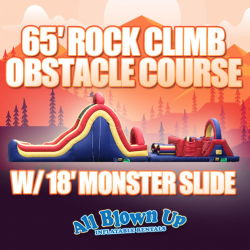 Our 65’ Rock Climb Obstacle Course with 18’ Monster Slide is great for all ages. It features a rock wall and a super tall 18' Monster Slide. This inflatable obstacle course is sure to make your next backyard event a huge hit!